When I took over the 3.15 ha of vineyards, all between 40 and 80 years old, and started my own winery, I decided to experiment new production methods that are environmentally groundbreaking. 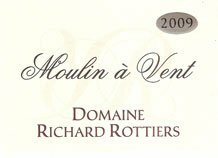 My goal is to become completely organic within five to seven years, and therefore, produce wines that will reflect the unique Moulin a Vent terroir. 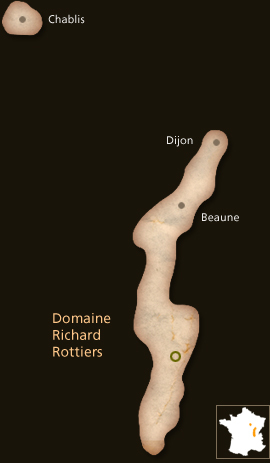 The winery is located in Romaneche-Thorins. There I met my partner Corinne, and through our relationship, I have discovered and developed a true passion for this land, its history, evolution and potential. Before that, and through various experiences in wine making and vineyard management, I learned the techniques that make a great wine. My experience and training come from the following regions: Chablis, Gaillac, South Africa, New Zealand, Luberon and Brouilly. Through our farming process we focus on the soil as well as the environment in order to harvest grapes that are disease-free and at the right maturity. We use goblet pruning and leave six to eight buds in order to control yield. In the spring, we remove excess buds and leaves to allow air flow and limit mold. We maintain and control temporary ground cover with grass and the farming of the soil. The spread of vine diseases is avoided with the practice of integrated vineyard management methods. We use compost tea and liquid plant manure along with some mild insecticides and fungicides. The grapes are hand-picked and carefully sorted in the vineyards so that only the best of the crop is kept. The Moulin a Vent A.O.C. (Appellation d’Origine Controllee) was created in 1924, but there have been vineyards on our hillsides since the 1st century, during the Roman invasion. In the 15th century, a windmill was built on top of the hill overlooking the town of Romaneche-Thorins. It became and still is the majestic emblem of our appellation. The vineyards were planted East-South East, a perfect exposure since they benefit from the morning sun. The soil is composed of pink brittle granite. The vineyards in Moulin a Vent are indeed adjacent to the eastern side of the Massif Central mountain range. This particular soil comes from the Hercynian fold that took place during the Paleozoic era, about 250 million years ago. Vineyard roots penetrate those rock fragments in order to extract minerals that are lodged within the bedrock. This is where the manganese seams can be found and where the typical aromas of violet and iris found in Moulin a Vent wines originate. Up until the beginning of the 20th century, mines were present in Romaneche-Thorins and manganese seams were extracted to be later shipped to Lyon via the Saone River and used in the manufacturing of solid alloys. These very poor soil conditions are ideal to obtain a high quality wine from the Gamay varietal, which tends to be a vigorous grape with high production yields. Incidentally, this terroir enables the Gamay grape to unleash its aromas to their full potential. Every year, various juices are analyzed and the results show that, compared to the surrounding areas, juices that come from the Moulin a Vent region have the highest levels of polyphenols. Because of this particular soil and climate the Moulin a Vent aging process is unusual: After a few years the wine “pinote,” meaning its aromas resemble those of a Pinot Noir. We are very careful in keeping each lot separate, so that the winemaking techniques can be adapted to each lot’s particular soil and climate characteristics. Wine making is traditional with the partial use of CO2 and the use of a soft extraction process: pump-overs and delestages (rack and return). The alcoholic fermentation is maintained at an average temperature, hence bringing out the fruit aromas, since there is naturally already enough tannin in the juice. After press, wines are transferred into vats and barrels for the malolactic fermentation and the aging process: six months for the traditional Moulin a Vent and 10 months for the Moulin a Vent Champ de Cour. This unique wine comes from 0.80 ha of old vines, which are located in the heart of the renowned ‘Champ de Cour’ terroir. It is surprisingly crisp and complex; it went through a partial CO2 maceration process during 12-15 days, a ten-month aging process in barrels, and is not filtered. The entire crop is hand-picked and carefully sorted before being put into vats. The grapes are kept in temperature controlled vats. 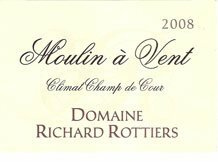 This method allows for fruit aromas as well as subtle and delicate aromatic reminders of the Moulin a Vent terroir to be gently extracted from the Gamay grapes. The final and perfect balance of our wines is achieved through temperature controlled fermentation and barrel aging throughout the whole winter season.